Statins are well known lipid lowering agents that inhibit the enzyme 3-hydroxy-3-methylglutaryl–CoA (HMG-CoA) reductase. They also activate drug metabolism but their exact receptor-mediated action has not been proven so far. We tested whether atorvastatin and rosuvastatin are direct ligands of human constitutive androstane receptor (CAR). We measured binding activities of atorvastatin and rosuvastatin to the human constitutive androstane receptor/retinoid X receptor α ligand-binding domain (CAR/RXRα-LBD) heterodimer with surface plasmon resonance (SPR). Additionally, three-dimensional models of CAR/RXRα-LBD were constructed by ligand-based and structure-based in silico modeling. Experiments and computational modeling show that atorvastatin and rosuvastatin bind to the human CAR/RXRα-LBD heterodimer, suggesting both can modulate the activity of CAR through direct interaction with the LBD of this receptor. We confirm that atorvastatin and rosuvastatin are direct ligands of CAR. The clinical consequences of CAR activation by statins are in their potential drug-drug interactions, and changes in glucose and energy metabolism. Statins, which have been recognized as drugs of choice for use in patients at high risk for developing cardiovascular disease, also may have some side effects, including an increased risk for diabetes (Sattar et al., 2014). Transcriptome analyses have revealed that rosuvastatin and atorvastatin affect expression of many metabolic and signaling pathways in the liver, including drug metabolism (Hafner et al., 2011). Several statins have also been identified as inducers of drug metabolism and potential agonists for the constitutive androstane receptor (CAR, NR1I3) (Kocarek et al., 2002; Kobayashi et al., 2005; Monostory et al., 2009). However, discrepancies among the studies exist. For example, a study using cell-based reporter assay and CAR inverse agonist identified fluvastatin, atorvastatin, simvastatin, and cerivastatin as human CAR (hCAR) activators (Kobayashi et al., 2005; Monostory et al., 2009). However, in a study using a ligand-binding assay none of the tested statins (fluvastatin, atorvastatin, simvastatin) were confirmed to be activators of hCAR (Howe et al., 2011). In addition, atorvastatin did not activate hCAR using two-hybrid assembly (Hoffart et al., 2012). Thus, although studies have suggested that statins might be ligands of this nuclear receptor, experimental evidence measuring direct binding of statins to CAR has been lacking so far. CAR is a member of the nuclear receptor superfamily and was initially discovered as a xenosensor regulating drug metabolism (Honkakoski et al., 1998; Sueyoshi et al., 1999). CAR also was implicated in the regulation of lipid, glucose, and energy metabolism, proliferation, and many other pathways (Ueda et al., 2002; Režen et al., 2009). Therefore, the clinical relevance of statin–CAR interactions is not only in potential drug-drug interactions but also in changes in glucose and energy metabolism induced by statins. In this study we have combined computational and experimental approaches to determine whether rosuvastatin and atorvastatin are ligands of the CAR/retinoid X receptor α (RXRα) heterodimer. Using surface plasmon resonance (SPR) we measured the binding of atorvastatin, rosuvastatin, and 6-(4-chlorophenyl)imidazo[2,1-b][1,3]thiazole-5-carbaldehyde O-(3,4-dichlorobenzyl)oxime (CITCO) to the CAR/RXRα ligand-binding domain (LBD) heterodimer. We also used ligand and structure-based modeling of different statins to CAR and the pregnane X receptor (PXR, NR1I2), another drug metabolism-inducing nuclear receptor. The materials and methods are described in more detail in the Supplemental Data. The glutathione S-transferase (GST)-hCAR (gift from Jean Marc Pascussi, INSERM, France) and GST-hRXRa-LBD (Addgene, Cambridge, MA) plasmids were transformed into the BL21 (DE3) Escherichia coli strain. Briefly, the overnight culture was grown in Lysogeny broth medium with ampicillin, then protein expression was induced with the addition of isopropyl β-d-1-thiogalactopyranoside (IPTG). Cell supernatant was loaded on a GST affinity column (Clontech, Palo Alto, CA) and concentrated using a Microcon YM-30 centrifugal filter (Millipore, Bedford, MA). The purity of the isolated GST-hCAR and GST-hRXRα-LBD were checked by SDS-PAGE and Western blot analysis. The interaction of rosuvastatin, atorvastatin, and CITCO was measured using a Biacore X analytical system and CM5 sensor chip (Biacore/GE Healthcare, Uppsala, Sweden). We prepared 10 mM stock solution of each analyte in dimethylsulfoxide, which then was diluted into a series of concentrations with the running buffer to detect direct binding with immobilized GST-hCAR/GST-hRXRα-LBD. The equilibrium dissociation constant (KD) values were determined by fitting the data to the steady-state affinity model using BIAevaluation software (Biacore/GE Healthcare). Previously generated pharmacophores for PXR or CAR agonists or Bayesian models (Ekins et al., 2009) generated with steroids or diverse compounds were employed to generate predictions for the statins tested in this study. The crystal structures of PXR and CAR were obtained from the Protein Data Bank (www.rcsb.org) with codes 1M13 and 1XVP, respectively, and used for docking. Because it was still not known whether atorvastatin and rosuvastatin are binding to human CAR, we measured the interaction of rosuvastatin, atorvastatin, and the positive control CITCO with hCAR using the SPR technique. The structures of the molecules are shown in Supplemental Fig. 1. Recombinant proteins GST-hCAR and GST-hRXRα-LBD were isolated and their purity assessed by SDS-PAGE and Western blot analysis (Supplemental Fig. 2). The SDS-PAGE analyses of recombinant proteins revealed high purity, and the Western blot analyses confirmed the presence of GST proteins. The GST-hCAR/GST-hRXRα-LBD heterodimer was covalently attached to the surface of the SPR sensor chip and assayed with at least four different concentrations of compounds. Each concentration was injected 3 times to test the reproducibility. All binding responses and KD values were reproducible, which indicates that immobilized complex did not lose activity over time. As expected, CITCO, which is known to be a direct ligand for hCAR, showed specific binding to the complex. We also observed specific concentration-dependent binding of both statins of this study (Fig. 1). The measured KD indicated that rosuvastatin binds to the CAR/RXR heterodimer with approximately 2-fold higher affinity than atorvastatin, but approximately 3-fold lower affinity than CITCO (Table 1). A comparison of measured maximal response with the theoretical maximal response indicated that several molecules of atorvastatin and CITCO bind to the hCAR/hRXRα-LBD complex (Table 1). By applying SPR we show for the first time that atorvastatin and rosuvastatin directly bind to the hCAR/RXR-LBD heterodimer. SPR analysis of atorvastatin, rosuvastatin, and CITCO binding to hCAR/hRXRα-LBD heterodimer. Different concentrations (1.56, 3.125, 12.5, 25, and 50 µM for CITCO and 6, 12.5, 25, 50, 75, 100, and 150 µM for atorvastatin and rosuvastatin) of analytes were tested for the binding (left panels). 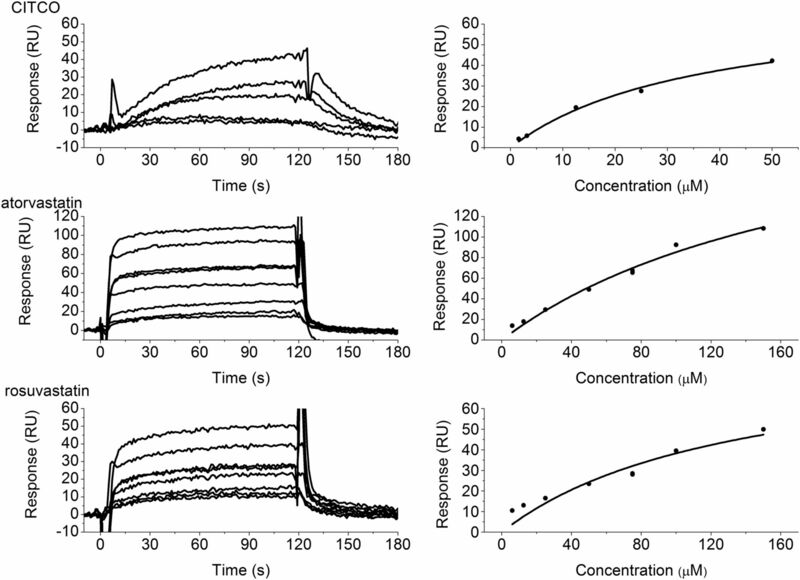 The binding curves (right panels) were generated by fitting the steady-state response levels at the end of the association phase versus the concentration of the injected analyte. The KD values were obtained by fitting the data to the steady-state affinity model. For each analyte six or seven independent titration experiments were performed. Binding of statins to hCAR is consistent with our previous transcriptome study, in which we showed that many genes were differentially expressed in human primary hepatocytes treated with atorvastatin and rosuvastatin and are under direct regulation of CAR (Hafner et al., 2011). Another study used surface plasmon resonance to test binding of atorvastatin and hCAR with coactivator (Hoffart et al., 2012). They preincubated atorvastatin or CITCO with CAR-LBD protein and injected it onto immobilized steroid receptor coactivator 1–receptor interaction domain (SRC-1-RID) protein. Under these conditions atorvastatin did not induce binding of hCAR-LBD with coactivator SRC-1. Further, they did not observe the assembly of human CAR-LBD with coactivators in COS1 cells. The difference in results obtained by SPR between our study and that of Hoffart et al. (2012) was probably due to the different CAR dimerization partner and steps used. We used RXR as a dimerization partner, and studies show that RXRα may also have a role in stabilizing CAR-LBD in its active conformation via direct interactions across the heterodimer interface (Xu et al., 2004). RXR is also important for recruitment of coactivators such as SRC-1 (steroid receptor coactivator 1) (Dussault et al., 2002; Pavlin et al., 2014). Also, we tested the binding of atorvastatin to the CAR/RXR dimer whereas Hoffart et al. (2012) tested binding of the atorvastatin–CAR pair to the SRC-1 coactivator. It is important to note that none of the described experiments published on statins used physiologic concentrations of the drugs. All used micromolar concentrations, but in humans in serum only nanomolar concentrations were measured; certainly concentrations in the liver have not been determined, so it is unclear how the in vitro observations relate to the in vivo situation. Our computational predictions using a structure-based or ligand-based approach indicated that statins are good potential ligands for CAR and PXR with little difference in potential between them. Furthermore, statins docked in CAR produced scores that correlate with the KD values determined by SPR. Our data suggested variability in binding to these different models (Table 1, Supplemental Table 1, Supplemental Fig. 3). Based on the docking results, the statins appeared to be good ligands for both CAR and PXR. Atorvastatin had the highest score against CAR (73.18), and rosuvastatin was lower (67.09) (Table 1). Similarly, the pharmacophores and Bayesian models suggest that all other statins will likely bind to CAR and PXR (Supplemental Table 1). These results broadly agree with the published data, confirming that the majority of statins are CAR/PXR activators, although the manner of this activation awaits experimental confirmation in the future. When comparing these scores with other studies using the same in silico approaches, we observed that the calculated scores for statins are within the same range as for known hCAR activators (Kortagere et al., 2009; Lynch et al., 2013). Interestingly, we and others have predicted that pravastatin is also a good potential ligand for CAR and PXR, although this statin has never been shown to have any ability to induce these two nuclear receptors or drug metabolism (Howe et al., 2011). In conclusion, these findings are important for understanding the full biologic consequences of statin exposure due to molecular interaction of statins with nuclear receptors. We showed in silico that statins are potentially ligands of CAR and PXR and confirmed in vitro that atorvastatin and rosuvastatin directly bind to the CAR/RXRα dimer. As CAR and PXR regulate not only drug metabolism but also glucose and energy metabolism, this had led us to the assumption that they are potentially involved in the statins’ unwanted side effects such as the increase in developing type 2 diabetes in humans. Additionally, we conclude that computational approaches may be useful for assessing statin binding to CAR and PXR and that SPR can provide valuable insights on binding to validate these predictions. The authors thank Biovia for providing Discovery Studio. Participated in research design: Režen, Rozman. Contributed new reagents or analytic tools: Ekins, Kortagere. Performed data analysis: Režen, Hafner, Hodnik, Rozman, Ekins, Kortagere. Wrote or contributed to the writing of the manuscript: Režen, Hafner, Kortagere, Ekins, Hodnik, Rozman. T.R. and M.H. contributed equally to this work. This work was supported by the Slovenian Research Agency [Grant P1-0104, P1-0390], and was part of the doctoral thesis of M.H. (2002) A structural model of the constitutive androstane receptor defines novel interactions that mediate ligand-independent activity. Mol Cell Biol 22:5270–5280. (2009) Challenges predicting ligand-receptor interactions of promiscuous proteins: the nuclear receptor PXR. PLOS Comput Biol 5:e1000594. (2011) The human primary hepatocyte transcriptome reveals novel insights into atorvastatin and rosuvastatin action. Pharmacogenet Genomics 21:741–750. (2012) Effects of atorvastatin metabolites on induction of drug-metabolizing enzymes and membrane transporters through human pregnane X receptor. Br J Pharmacol 165:1595–1608. (2011) The statin class of HMG-CoA reductase inhibitors demonstrate differential activation of the nuclear receptors PXR, CAR and FXR, as well as their downstream target genes. Xenobiotica 41:519–529. (2005) Identification of HMG-CoA reductase inhibitors as activators for human, mouse and rat constitutive androstane receptor. Drug Metab Dispos 33:924–929. (2002) Regulation of CYP2B6 and CYP3A expression by hydroxymethylglutaryl coenzyme A inhibitors in primary cultured human hepatocytes. Drug Metab Dispos 30:1400–1405. (2009) Hybrid scoring and classification approaches to predict human pregnane X receptor activators. Pharm Res 26:1001–1011. (2013) Identification of novel activators of constitutive androstane receptor from FDA-approved drugs by integrated computational and biological approaches. Pharm Res 30:489–501. (2009) Drug interaction potential of 2-((3,4-dichlorophenethyl)(propyl)amino)-1-(pyridin-3-yl)ethanol (LK-935), the novel nonstatin-type cholesterol-lowering agent. Drug Metab Dispos 37:375–385. (2014) Agonist ligands mediate the transcriptional response of nuclear receptor heterodimers through distinct stoichiometric assemblies with coactivators. J Biol Chem 289:24771–24778. (2009) Effect of CAR activation on selected metabolic pathways in normal and hyperlipidemic mouse livers. BMC Genomics 10:384. (2014) The use of statins in people at risk of developing diabetes mellitus: evidence and guidance for clinical practice. Atheroscler Suppl 15:1–15. (2002) Diverse roles of the nuclear orphan receptor CAR in regulating hepatic genes in response to phenobarbital. Mol Pharmacol 61:1–6. (2004) A structural basis for constitutive activity in the human CAR/RXRα heterodimer. Mol Cell 16:919–928.